Today, the fast-paced world is shaping and changing our collective and personal experience with unprecedented velocity. “China” after the Open Door Policy has grown into an economy and cultural giant that contends with West, and has been gradually leading the trend in Asia. However, one might still wonder, under which context did the “qualitative” changes of Chinese contemporary art happen? In fact, China’s earlier socialism feature (relying on collective force such as seen in the ‘85 New Wave Movement, Star Group, and Political Pop) has slowly given way to individual expression (the evolution of perception from immediate reflection to eternal aspiration). The transformation continues on, artists who were born in the late ’70s and ‘80s (the Post-Mao Period) enjoy better quality of life and liberty, but they also inevitably face competitors from all over the world – and the same challenge applies to most young artists from Taiwan, Hong Kong, Japan, and Korea, who must strive to adapt globalization. We can therefore say that the works we see are artists’ honest respond to the contemporary time, but at the same time, none is able to define the context. This paradoxical connotation reminds me of a passage by Okwui Enwezor, curator of the 56th Venice Biennale: “I came to this title because I was imagining what role a Biennale could play in a moment of such uncertainty. I cannot remember a time more unstable, more ominous than this generation.” Indeed, the time may confuse and fill us with doubts; the question is how should we embrace the diversity of “contemporaneity” and discover some patterns? The curatorial programme of A+ Contemporary consists of exhibition, forum, and publication of scholarly catalog; its selected presentations center around the different facets of artistic innovation and concept, and the research scope extends to cross-disciplinary analysis. The opening exhibition features artists from Taiwan and Hong Kong, both settle within the greater Chinese culture, similar yet not identical, correlated yet unlike one another. The exhibition title “<- ->” implies a bilateral expansion which also mutually attracts, while the departure point of both arrows represents China. China, Asia’s largest carrier of art and culture, no longer imitates the West but rather has adapted and integrated Western ideas, and evolved to become a unique autonomous entity. When China becomes one of the mainstream players in the field of contemporary art, its various representations, which contain social and cultural significance, are highly discussed in the global art scene. Artists from Taiwan and Hong Kong inherit the essence of Chinese culture, witness the legacy of colonialism, and open to Western art education—such complex cultural identity remains a distinctive trait that I have never seen in any contemporary artists who were born and raised in China. “Art”, after all, is essentially a performance that transcends emotions and imaginations inspired by daily experiences, the cognitive and imaginative expressions of these artists therefore possess further significance and wit, and must to be reviewed seriously in the course of Asian contemporary art. 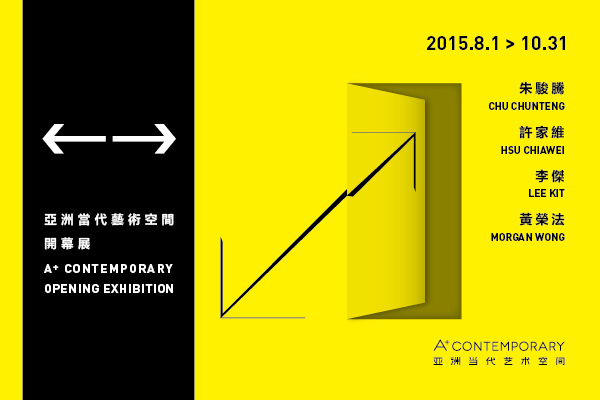 Exhibition “<- ->” consists of artists Chu ChunTeng, Hsu ChiaWei, Lee Kit, and Morgan Wong. Morgan Wong (Hong Kong) focuses on durational performance and temporality with pieces ranging from performance, video, and installation to works on paper. He exploits the language of technology and interactive media to encourage active engagement with the artist’s thoughts. His work The Remnant of My Volition Series reconstructs reality through which profound societal metaphor is being communicated. The steaming vapor, scent and vibration of The Foaming Weariness by Chu ChunTeng (Taiwan) exhibit his uneasiness to conform to a different culture and lifestyle during his time abroad in Europe. Through video work How Kind of You to Let Me Come, one can observe the fascinating dynamics of learning and being educated, the shift from ambivalence to adaptation and various aggressive and passive attitudes- this incessant anxiety is in fact a truthful reflection of our society. Hsu ChiaWei’s (Taiwan) creative method is a specific kind of “narrative” – a way of documenting that interferes with the text in reality by focusing on site-specific and peculiar characteristics, such as memory, imagination, or identification. “Huatung Village” was once an Amis tribal settlement located in the Xizhi district of Taipei. The artist invited the previous chieftain of Huatung Village to give a narrative in the Amis language of what had happened there via juxtaposing separate audio and video tracks to reconstruct an already non-existent tribe in a real area. Chu ChunTeng (b. 1982, Taiwan) graduated with a BA in Film Production from Shih-Hsin University in 2006, and went on to receive an MFA from Goldsmith University of London in 2010. Chu ChunTeng currently lives and works in Taipei. Chu’s recent solo exhibitions include: OK, I am Flying…(Art Issue Project Room, Taipei, 2013), My Name is Little Black (Association of the Visual Arts, Taipei, 2012). His recent group exhibitions include 2014 Taipei Biennial- The Great Acceleration (Taipei Fine Art Museum, Taichung, 2013), I Spy with My Little Eye (Kunsthaus, Essen, 2012), Site of Flesh and Stone (Stimotas Building, Istanbul, 2011), Encounters with the Line (Glasgow Center for Contemporary Arts, Glasgow, 2010), The Simply Art of Parody (Taipei Contemporary Art Museum, Taipei, 2009). He received Honorable Mention in both 2011 and 2012 Taipei Art Award. Hsu ChiaWei (b. 1983, Taiwan) graduated from the Department of Fine Arts of National Taiwan University of Arts in 2005, and received a Master’s degree from the School of Plastic Art of National Taiwan University of Arts. As of 2015, Hsu ChiaWei is participating in an artist residency program, and currently lives and works in Lille, France. Hsu has exhibited at The 55th International Art Exhibition- la Biennale di Venezia: This is not a Taiwan Pavilion (Palazzo Ducale, Venice, 2013), 2012 Taipei Biennial- Modern Monsters (Taipei Fine Arts Museum, Taipei, 2012), and Liverpool Biennial 2012 (LJMU Copperas Hills, Liverpool, 2012). His solo exhibitions include: On the Margin of Places (Kunstlerhaus Bethanien, Berlin, 2014), SH-SY5Y (NTUA Cultural and Creative Industry Park, Taipei, 2013). Hsu ChiaWei’s recent group exhibitions include: Hugo Boss Asia Art (Rockbund Art Museum, Shanghai, 2013), Taiwan International Documentary Festival (National Taiwan Museum of Fine Arts, Taichung, 2012), RENCONTRES INTERNATIONALES PARIS/BERLIN/MADRID (Centre Pompidou, Paris, 2010), Une Terrible Poetique (Olivier Houg Galerie, Lyon, 2011), Flu-Fatigue (Contemporary Art Center, Taipei, 2011). His work was nominated for the Hugo Boss Asia Art Award in 2013, was honored the S-An Cultural Foundation Award in 2009, and won the Taipei Arts Award in 2008. Lee Kit (b. 1978, Hong Kong) graduated from the Fine Art Department at the Chinese University of Hong Kong in 2003, and received a Master’s degree from the Fine Art Department at The Chinese University of Hong Kong. He currently lives and works in Taipei and Hong Kong. Lee Kit represented Hong Kong at The 55th Venice Biennale (Hong Kong Pavilion, Venice, 2013). His recent solo exhibitions include: And: Lee Kit Solo Show (Aike-Dellarco, Shanghai, 2014), How to Set Up a Room for Johnny? (Osage Gallery, Hong Kong, 2012), The Scent of a Person (Artissima, Turino, 2012), Every Breath You Take (Minsheng Art Museum, Shanghai, 2012), Remains from Several Days (Mori Gallery, Sydney, 2008), 3/4 Suggestions for a Better Living (Para Site Art Space, Hong Kong, 2007). His recent group exhibitions include: Duchamp and/or/in China (UCCA, Beijing, 2013), Print/Out (Museum of Modern Art, New York, 2012), Trading Futures (Taipei Contemporary Art Center, Taipei, 2012), The 43rd Art Basel Art Fair (Basel, 2012), Shanghai Biennial (Shanghai, 2012), What Should I Do to Live in Your Life? (Shariah Art Foundation, Shariah, 2012), Frieze Art Fair (London, 2011), No Soul for Sale (Tate Modern, London, 2010), The Touring around the World (The Bluecoat, Liverpool, 2010). Lee’s work is in the collections of the Stedelijk Museum voor Actuele Kunst in Belgium, the Hong Kong Museum of Art and among many other private collections around the world. Morgan Wong (b. 1984, Hong Kong) graduated from the School of Creative Media of City University of Hong Kong in 2007, and went on to receive an MFA from Slade School of Fine Art at University College London in 2011. Formerly based in Beijing and London, Wong currently lives and works in Hong Kong. His recent solo exhibitions include: Untitled- Expressway (Rolls-Royce Motor Cars, Hong Kong, 2015), NPO S-Air (Oyoyo Art Center, Sapporo, 2010), Once You Were Here (Para Site Art Space, Hong Kong, 2009). Wong’s recent group exhibitions include: Cosmos (Shanghai 21st Century Minsheng Contemporary Art Museum, Shanghai, 2014), We Love Video This Summer (Pace Beijing, Beijing 2014), 8th Shenzhen Sculpture Biennale (OCT Contemporary Art Terminal, Shenzhen, 2014), Encounters (Art Basel Hong Kong, Hong Kong, 2014), Artists Film International (Whitechapel Gallery, London, 2013), Liste 17 (Liste Art Fair, Basel, 2012), No Soul for Sale (Tate Modern, London, 2010). His work is also part of the collections of the City and County Museum Lincolnshire, The Edward James Foundation, and NPO S-AIR.